Designed with the serious shooter in mind, Butler Creek's famous Steel Lips magazines feature precision steel lips for smooth, reliable operation. 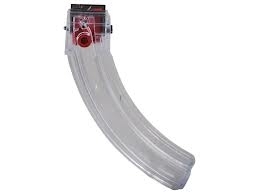 The translucent magazine body gives visual indication of the ammunition supply in the magazine while integrated pegs and holes allow up to three 10-round or two 25-round magazines to be hooked together for fast reloading. We cannot bill to or ship hi-cap magazines to the following states and cities: California, CT, New York, Massachusetts, Maryland, New Jersey, Aurora, IL Chicago, IL South Bend, IN Cincinnati, OH Cleveland, OH Columbus, OH Dayton, OH Toledo, OH. If you live in any of these locations, DO NOT ORDER THIS MAGAZINE.